Set sail for a memorable vacation in the home that has it all! Welcome Aboard to the perfect combination of comfort, entertainment, and relaxation. 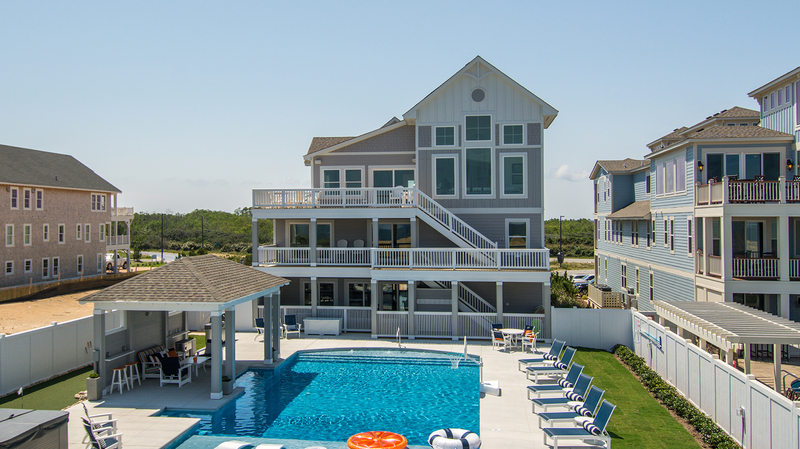 The top level offers breathtaking ocean views to the east and expansive views of the Audubon Nature Preserve and Currituck Sound to the west. An open and airy design allows guests to appreciate the Atlantic from the living room, dining area, or well-equipped kitchen. Enjoy spectacular sunsets each evening from the sunset lounge. Also on level three is a master bedroom with a king size bed and an elevator that conveniently services each level of the home. The middle level is comprised mostly of master bedrooms, five with king size beds, one with two twin beds and one with two sets of built-in bunk beds. Take in the peaceful beauty of the sun rising over the ocean from the sunrise lounge while enjoying morning coffee. Step out onto the deck to enjoy the salty breeze. The bottom level was designed with entertainment in mind. Watch a movie on the big screen in the theatre room, play a friendly game of pool in the rec room or lounge in the media room. Kitchenette in the rec room ensures that snacks and cold drinks are nearby for refreshment. This level also includes two master bedrooms, one with two queen size beds, each with a built in twin bed overhead, and one with a king size bed. Step outside to enter the superb pool area. The private pool is generously-sized (25’ x 50’) and includes a swim-up bar under a delightful poolside cabana. After a day of fun in the sun, rejuvenate with a soak in the hot tub while gazing at the stars. Two MBRs (K, 2Q each with overhead T); theatre room; rec room with kitchenette and pool table; media room; laundry; two half baths. Seven MBRs (K, K, K, K, K, 2T, 2BS); den; laundry. MBR (K); great room with gas fireplace; kitchen; dining area; den; half bath. Beach cabana service provided from April 29 to September 28 only (provides morning set-up and afternoon take-down of two umbrellas and six beach chairs on the beach), reduced greens fees at the Kilmarlic Golf Club. Garage is not available to guests. The Advance Property Hold fee is $500. This home has beautiful finishes and has every amenity. It looked like Joanna Gaines designed and decorated it.... truly beautiful! Out of all the homes we have stayed at with Twiddy over the years this one is our family’s favorite! The kitchen and the enormous pantry were incomparable! This home was beyond gorgeous! There wasn't a single detail in decor, or design that I would change. We had the most amazing vacation...and the most beautiful wedding celebration in this home! when was EC4 built ? Excellent question, Deborah! This beautiful home was newly constructed in 2017. Is that a Keurig coffee machine in sunset lounge? Also, looks like 2 drip coffee makers in kitchen. Is there a griddle or waffle maker? Ellen, EC4 does provide 2 griddles in the kitchen for guest's use. The Sunset Lounge currently offers a Keurig coffee machine. Are there any bicycles at the house or should guests bring their own? Excellent question, Caitlin! Bikes are not provided. If you would like to rent bikes for your stay, Just for the Beach, Moneysworth, and Ocean Atlantic Rentals all provide this service. For contact information, please visit www.twiddy.com/activities/services.aspx. Is this an event home? If so, what are max guests for day of event? That is a great question Megan, unfortunately, EC4 is not an event home. Are there updated photos of this home? Renee, at this time we do not have any additional photos available. Our photographers will post updated photos as soon as they are available. Thank you for your inquiry, Alexandra! The private pool at EC4 now offers the option of being heated for a fee.